Why measure the electron electric dipole moment (eEDM)? The Standard Model predicts an eEDM of approximately 10-40 e cm. Extensions to the Standard Model that could help us understand dark matter or matter/antimatter asymmetry predict much larger values for the eEDM. 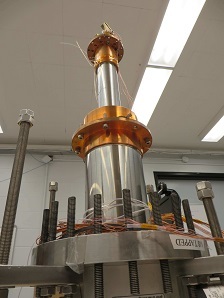 Therefore, precise eEDM measurements will guide extensions to the Standard Model. Current eEDM measurements limit its value to be less than 1.1 x 10-29 e cm. [ACME, Nature, 562:355 (2018); ACME, Science, 343:269 (2014); JILA, Phys. Rev. Lett., 119:153001 (2017); Imperial College, Nature, 473:493 (2011)] The EDM3 method has the potential to reduce the eEDM uncertainty by up to 5 orders of magnitude. Schematic of the EDM3 setup. The EDM3 method uses a large sample of polar molecules embedded within a rare-gas matrix. The polar molecules have their orientation fixed by the matrix, removing the need to apply an electric field during the eEDM measurement. State preparation and detection use polarized lasers, but the critical steps of our measurement are performed with radio-frequency transitions, and exploit the unique properties of the hyperfine structure of matrix-trapped molecules [arXiv:1806.06774]. The matrix allows for a large numbers of molecules to be studied. Additionally, the molecules are stationary in the matrix allowing for long measurement times. As a result, EDM3 may be able to reach statistical sensitivities that are many orders of magnitude beyond the current eEDM limit. The excellent statistical sensitivity will enable rapid and precise tests	of systematic effects. Very uniform electric and magnetic fields can be applied over the small volume being studied. There is no electric field applied during the spin precession, eliminating	electric-field systematics	(e.g., leakage currents	and	magneto-electric effects). The molecules are tightly trapped within the matrix. This eliminates	geometric phase systematics, and state preparation/detection errors arising from the	motion of the molecules. Simultaneous measurements on oppositely oriented molecules, interspersed within the same small volume, offer an ideal co-magnetometer for rejecting systematic errors arising from magnetic fields. The cryogenic environment allows for excellent magnetic shielding, and suppression of thermal voltages and currents. A large number of reversals are possible to control and measure systematic effect. Large dynamic range is available on several important parameters (including precession time, molecule concentration, and impurities), to study potential systematics. Measurements can be repeated with a new crystal with different levels of impurities and defects, or with a different choice of a rare gas or substrate. Measurements can be performed using molecules with very different sensitivities to the eEDM (e.g., CaF, YbF). These can be compared to separate the eEDM-dependent, from other systematic effects.